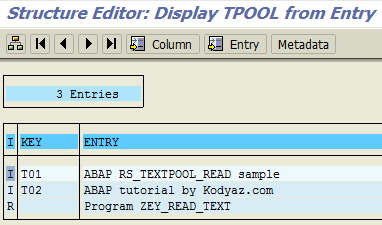 This ABAP tutorial shows to read text symbols of an ABAP program or class code in specified target language translation using RS_TEXTPOOL_READ function module. SAP developers can use ABAP function module rs_textpool_read within their ABAP codes to read text symbols defined in any ABAP program or class in the required language translation. 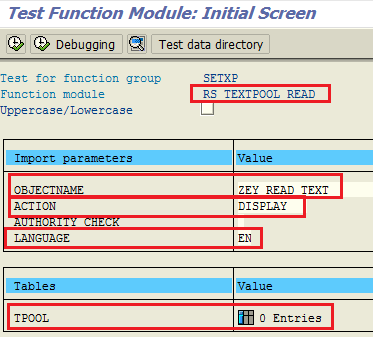 ABAP programmers can execute rs_textpool_read function module using SE37. 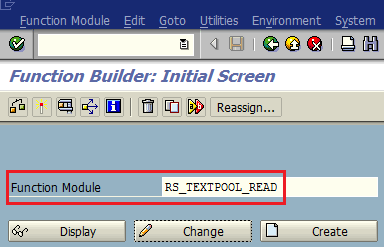 After "rs_textpool_read" is entered in the function module name text, press F8 to execute the ABAP function module. When the test function module initial screen is displayed, enter the following import parameters with corresponding values. ObjectName is the name of the ABAP program or ABAP class where the text symbols and translations are defined. Language is the import parameter where the developer defines which translation of the text symbols is requested. When you execute the function module using F8 after the import parameters are provided to read the desired language of text symbols translation of the target ABAP report, the TPOOL output table parameter will be populated with translated text symbol data. If as an ABAP programmer, you want to read text symbol translation in a specific language programmatically, below ABAP code block can be used as a starting code tutorial. Developers will realize that a table type variable of structure textpool is used for fetching text element translations into an internal table using RS_TEXTPOOL_READ ABAP function module. Later text symbol translations are read into an internal table, ABAP READ command can be used to get the specific text using KEY for filter and ENTRY for the text itself. DATA lt_text TYPE TABLE OF textpool. READ TABLE lt_text INTO ls_text WITH KEY key = 'T02'.